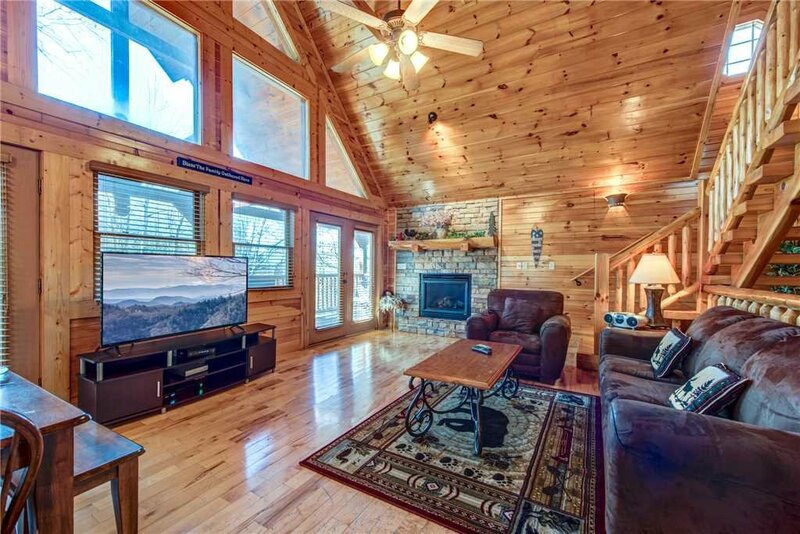 When you stay at Hemlock Manor, you’ll never be bored. 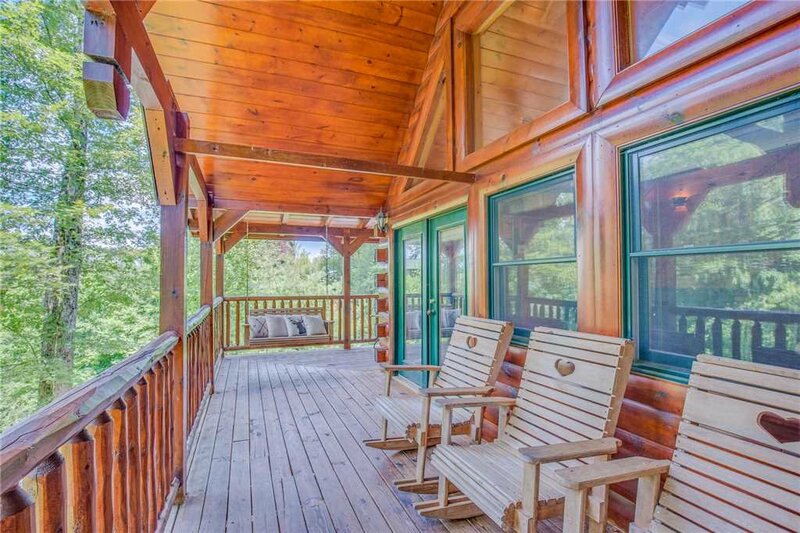 The three-bedroom log cabin, which sleeps ten people, is packed with amenities, including an outdoor hot tub, a pool table, air hockey, free WiFi, cable TV, and two huge decks so that you can enjoy the view of the surrounding woodlands to their fullest. 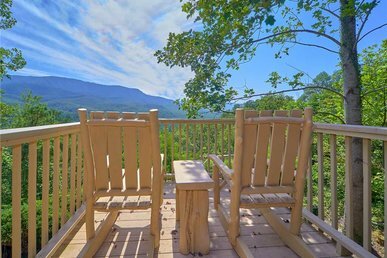 What’s more, it’s conveniently close to the many attractions of Gatlinburg and Pigeon Forge. 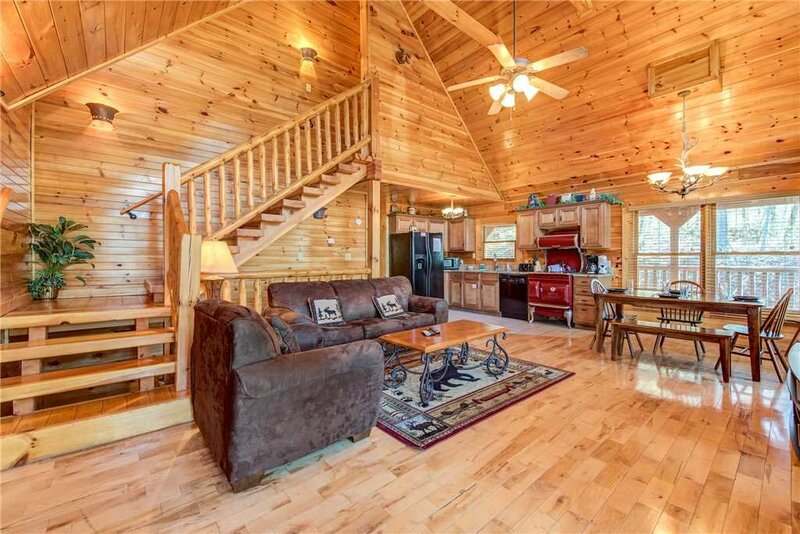 Hemlock Manor’s three bedrooms and three bathrooms are spread out among the home, one on each floor for optimal privacy. 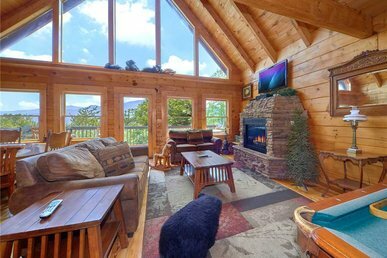 The master suite encompasses the entire loft, and it’s a truly deluxe retreat. 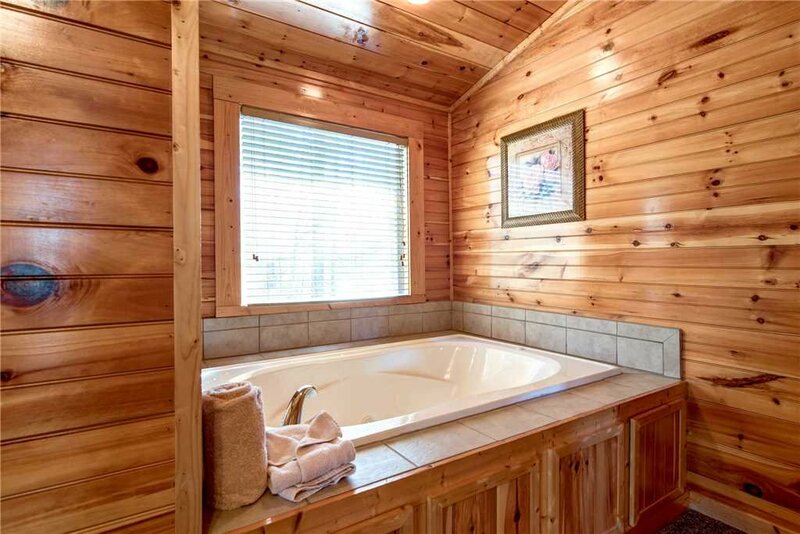 Before you spread out on the king-size bed, pamper yourself with a soak in the private jetted tub. 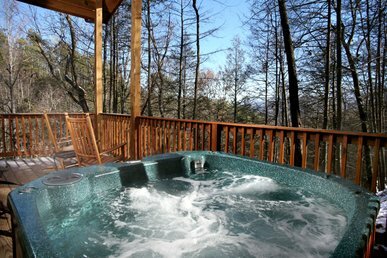 Even if you overdid it on the hiking trails or the ski slopes earlier in the day, the tub’s soothing waters will have you relaxed and rejuvenated in no time. 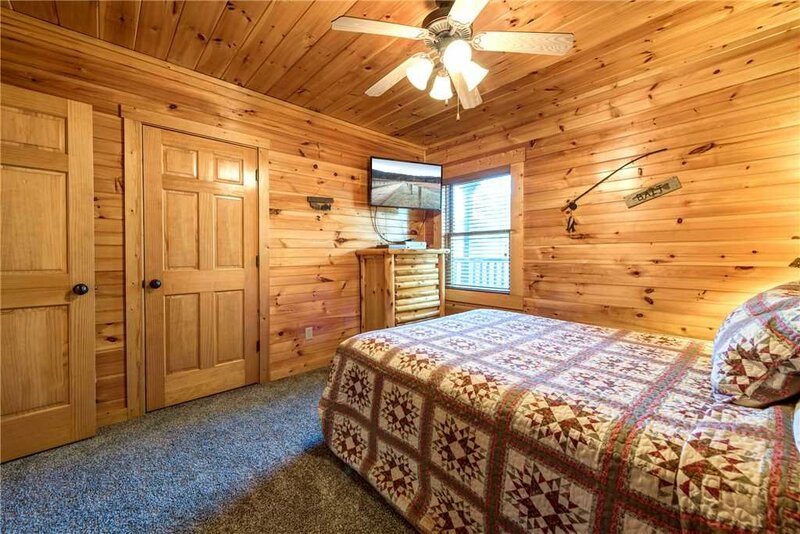 The golden glow of the bedroom’s fireplace will add to the welcoming ambiance in winter; the gentle breeze of the ceiling fan will lull you to sleep in summer. 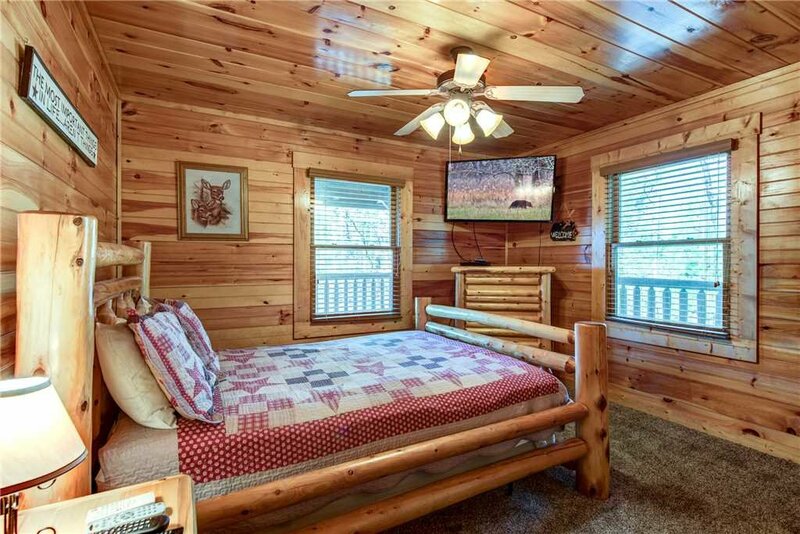 Like the master suite, the other two bedrooms have their own flat-screen TV and ceiling fan, along with comfortable log-frame queen-size beds. 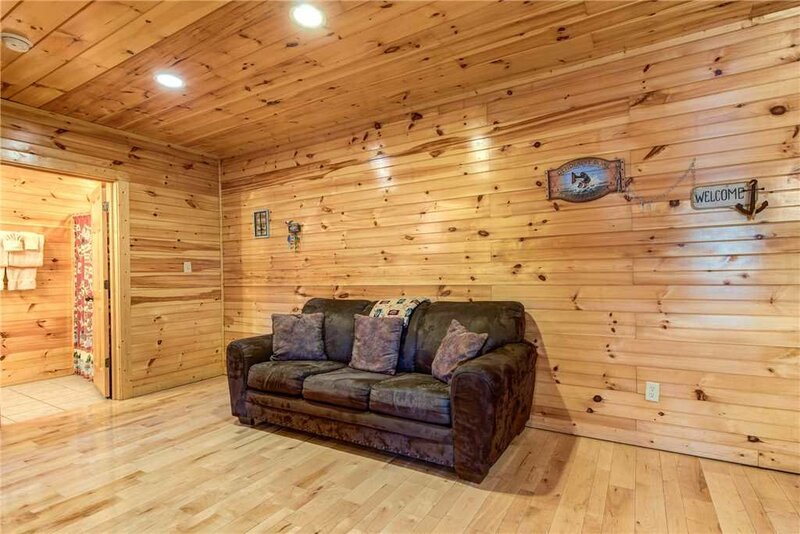 What’s more, sofas in the main floor’s great room and the downstairs game room convert into queen-size beds. 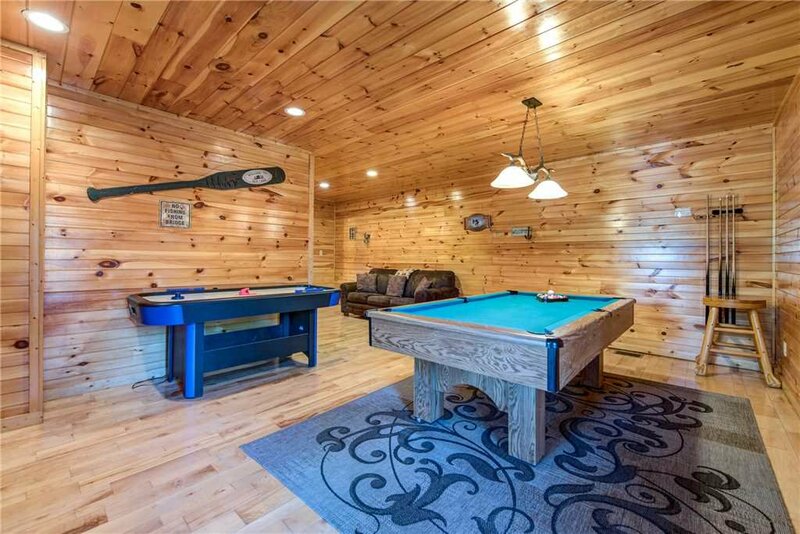 If you’re vacationing with the kids, they’ll probably beg to be allowed to sleep in the game room: After all, who wouldn’t want an air-hockey table and a pool table in their bedroom? 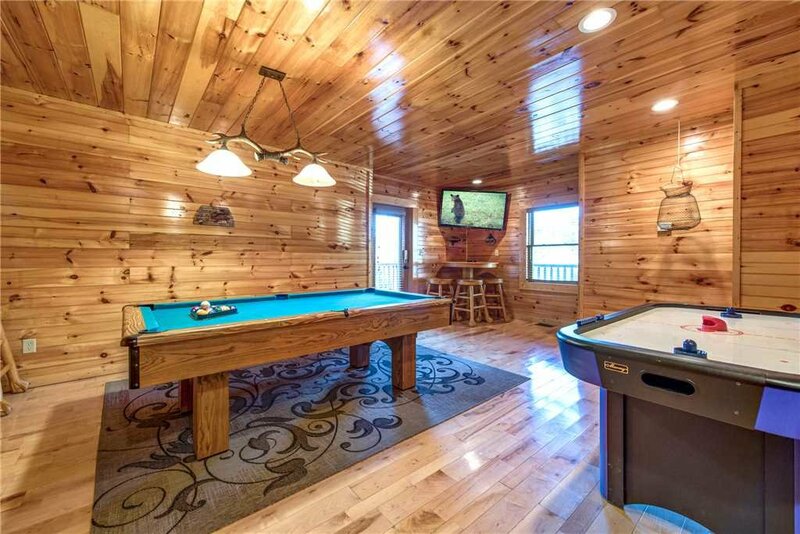 That’s right, the spacious game room has both, along with a flat-screen TV and a pub table perfect for playing cards or just hanging out. 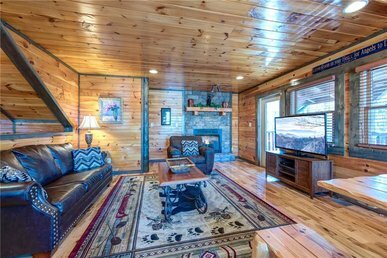 The great room has its own flat-panel TV, a 48” one, and marvelously comfortable seating for kicking back and watching a movie, catching up on your reading or emails, or indulging in a well-deserved nap. 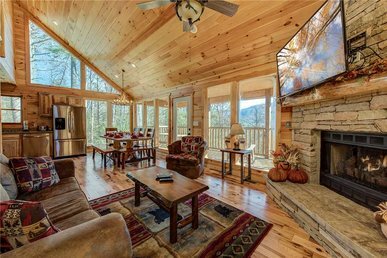 A double-height wall of windows lets in plenty of sunshine, which adds to the luster of the wood-planked floor and cathedral ceiling. 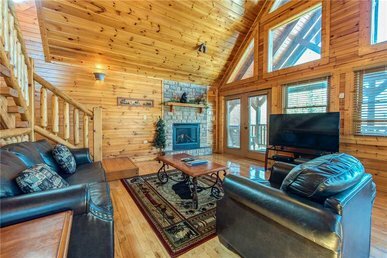 This room has its own gas fireplace and lots of space to gather around it, hot cocoa or Irish coffee in hand, on chilly winter evenings. 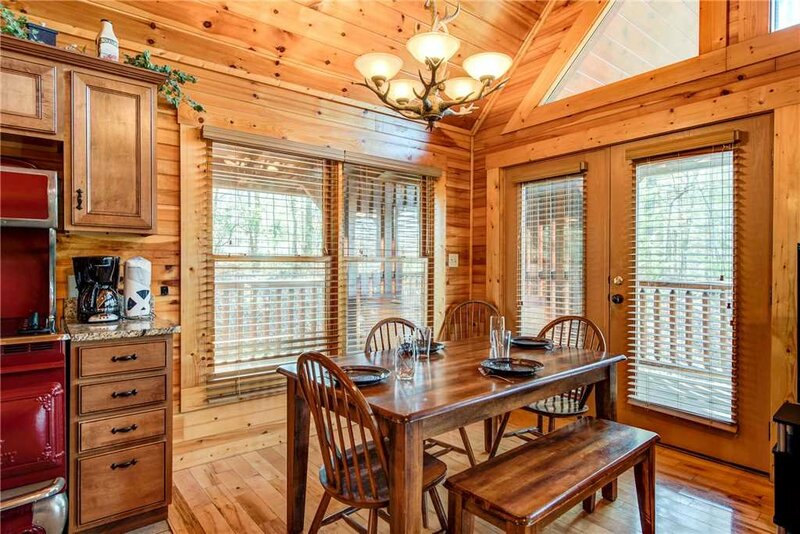 The dining table seats six people, and the kitchen has all the appliances, cookware, and tableware you need to prepare meals for even larger groups. 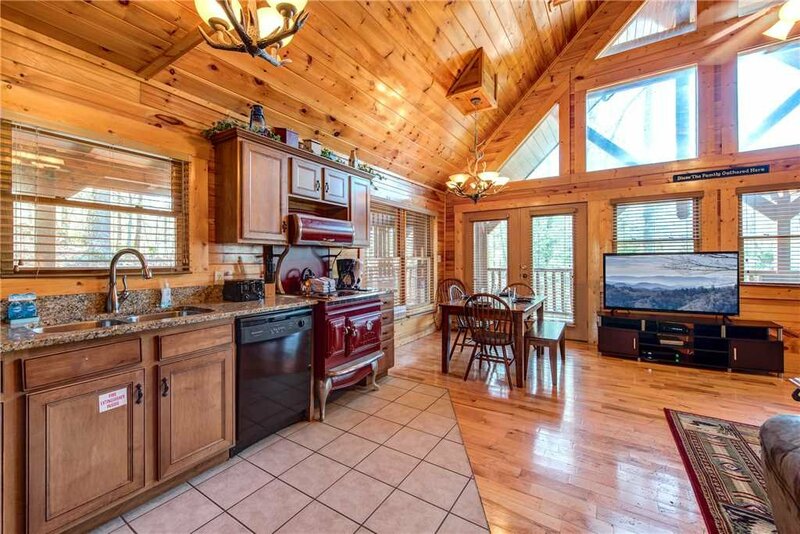 There’s a charcoal grill outside as well; for a real Smoky Mountain treat, grill some trout that you reeled in yourself from one of the local streams. 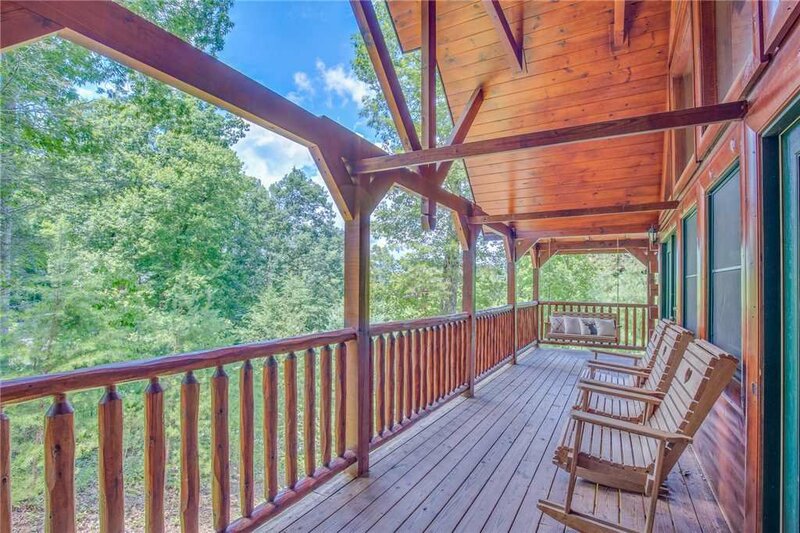 Even with all these great features, the best aspect of Hemlock Manor might be its two covered decks. 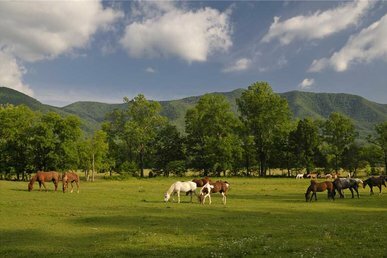 You’ll find plenty of rockers in which to sit back and listen to the songbirds in the sun-dappled trees. 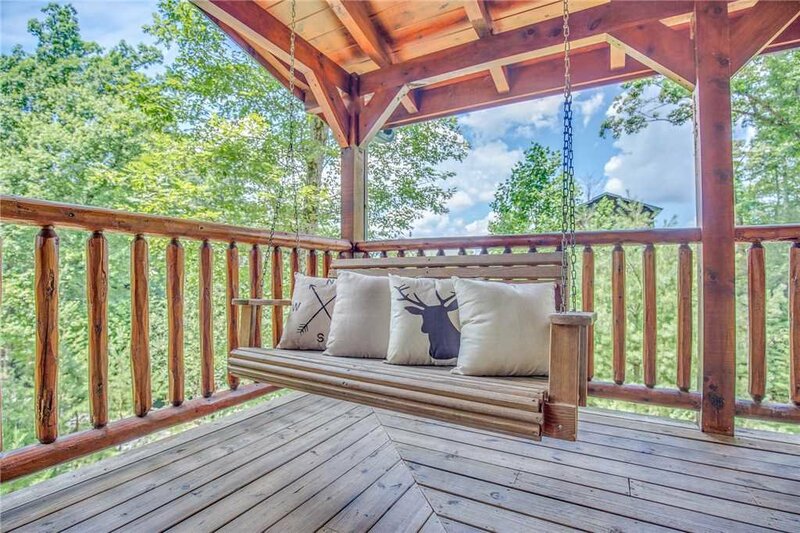 The porch swing will delight kids and adults alike (you can’t beat the romance of swinging with your special someone under a starry sky while being serenaded by crickets and whip-poor-wills). 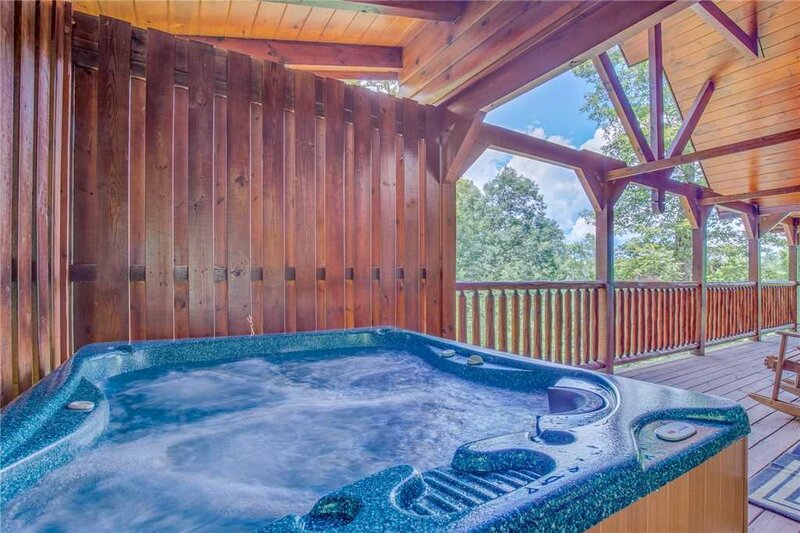 And let’s not forget the deck’s hot tub: The combination of steamy bubbles and the crisp mountain breeze is truly magical. 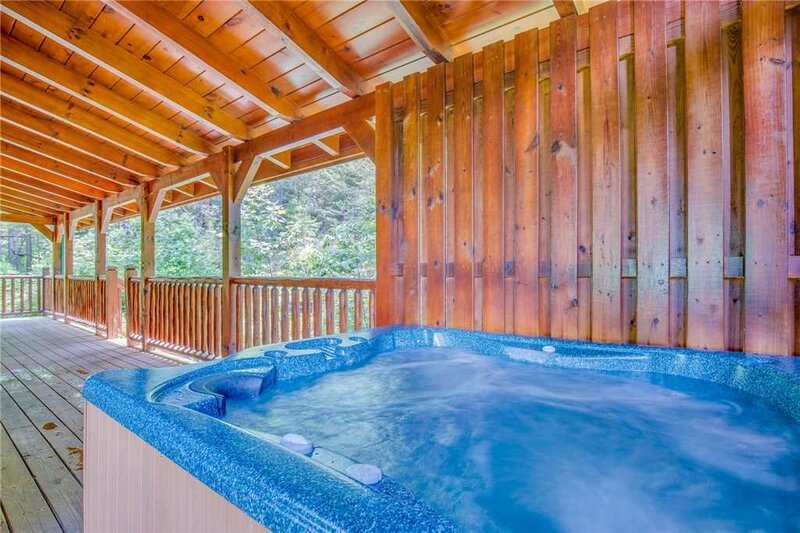 When you can tear yourself away from the hot tub, you’ll find a wealth of things to see and do just outside Hemlock Manor’s doorstep. 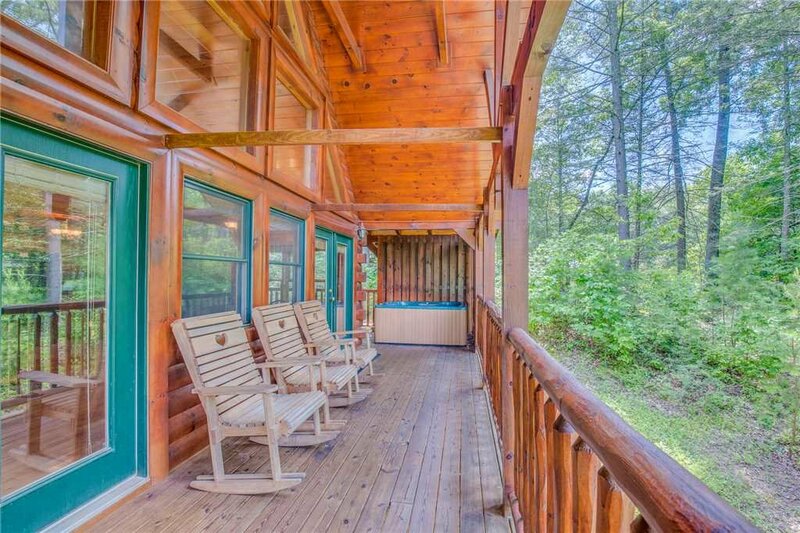 The cabin is less than a mile from Rocky Top Sports World (especially convenient if you’re in town for a sporting tournament) and from the Gatlinburg Arts & Crafts Loop, an eight-mile trail of more than a hundred studios, galleries, and shops. 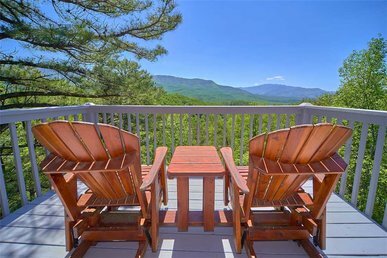 In less than fifteen minutes you can drive to the Great Smoky Mountains National Park and to downtown Gatlinburg, home to the Guinness World Records Museum, an aquarium, thrill rides, mini golf, and the tram that takes you up, up, and away to Ober Gatlinburg Ski Area and Amusement Park. 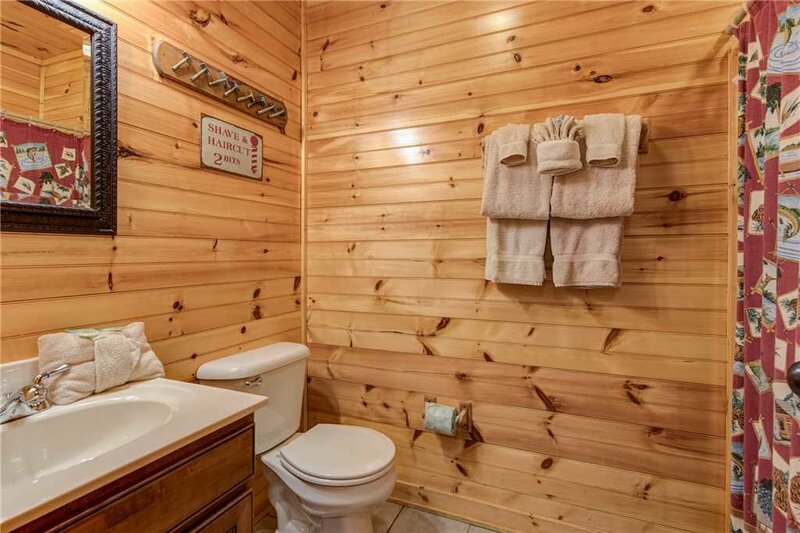 When you stay at Hemlock Manor, a fabulous time is practically guaranteed. 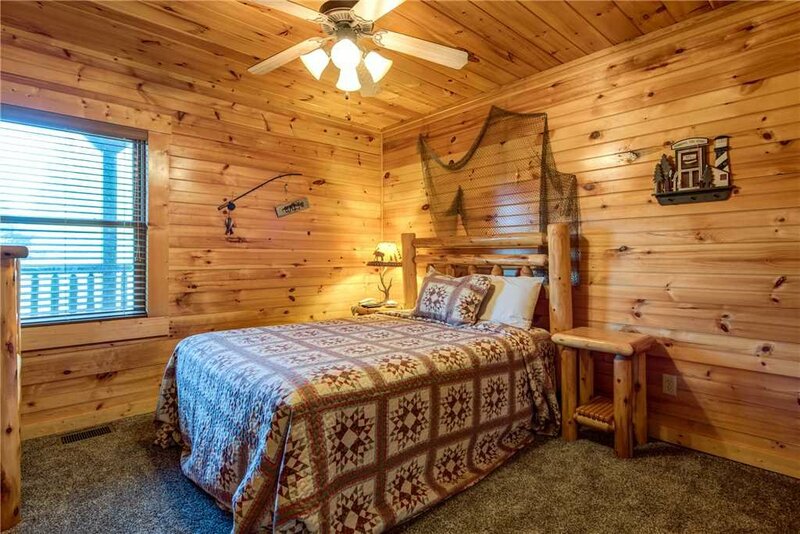 So go ahead and book your stay today. We can’t wait to see you! 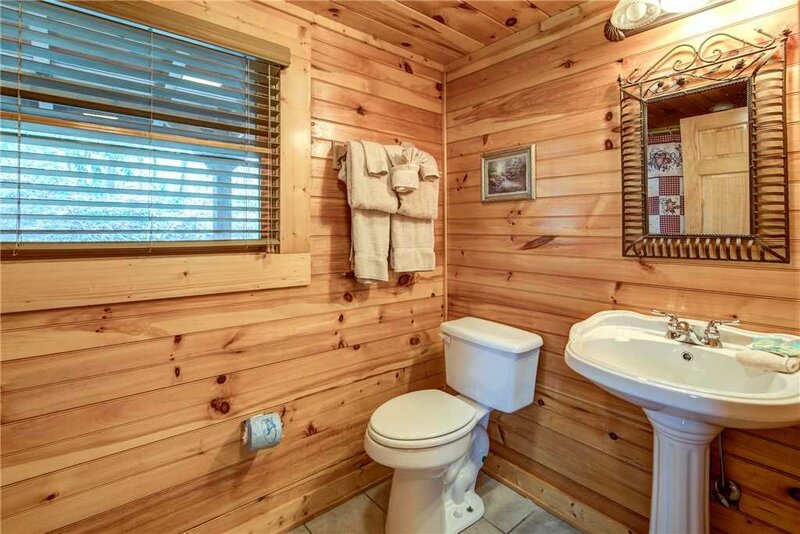 The home was accurately described on the website. We had a good experience and were pleased that all items in the house worked. Thank you for the four-star review and the positive comments! Come back soon! It was wonderful! 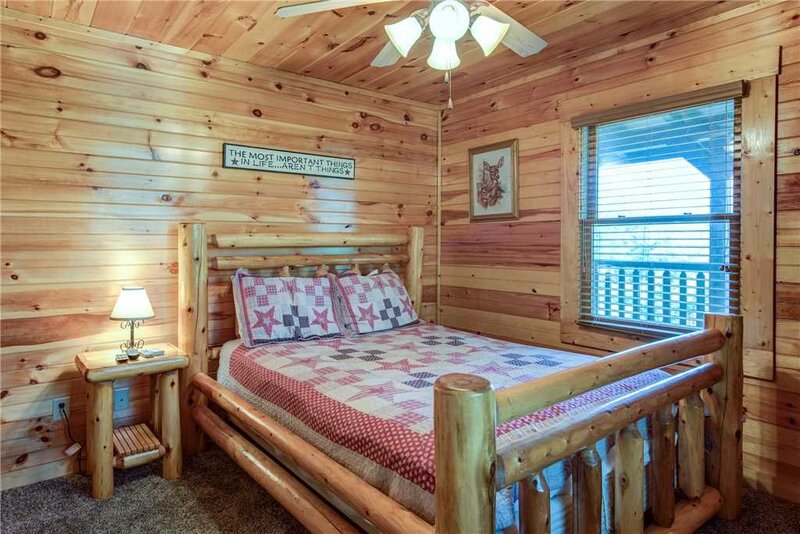 We would stay here again! Great place. Met all our needs. 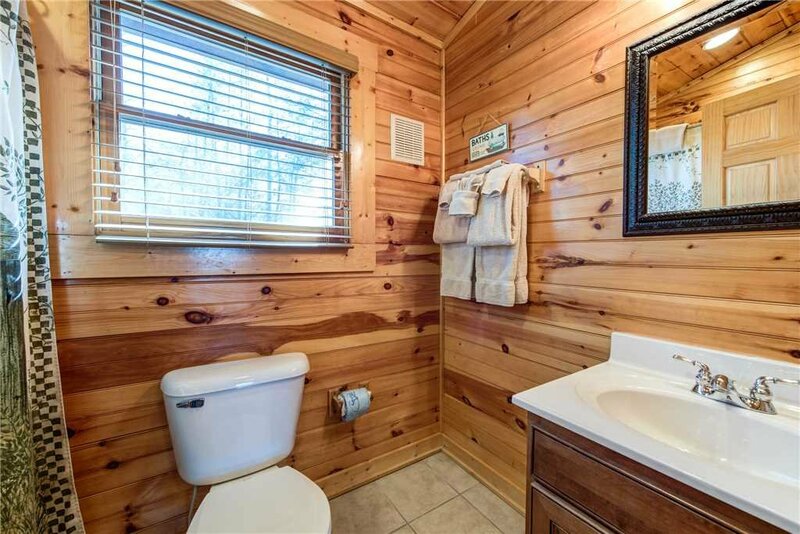 Some deeper cleaning might be needed, but it is a cabin. Might want to check closely, as we found some damage that appeared to have been "hidden." Thanks for choosing us on your recent trip to the area! We appreciate the five-star rating and hope to have you back in the near future! 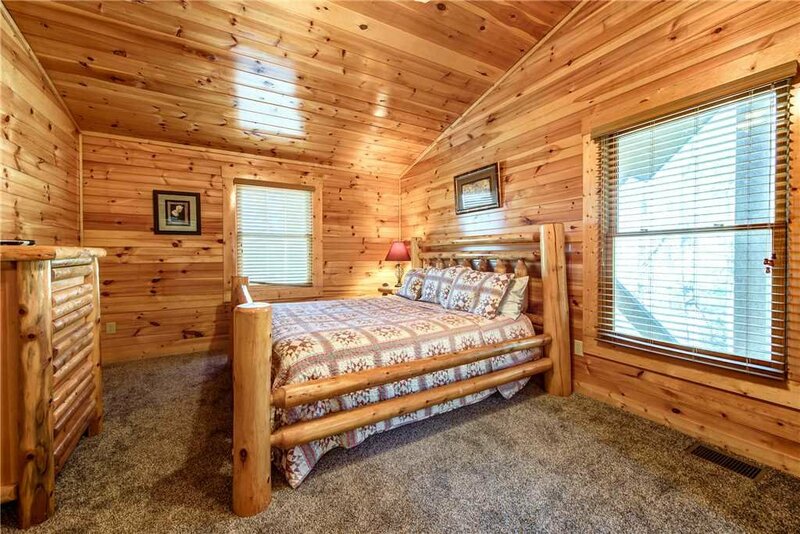 Master bed and couch is very worn out and hurt our bodies to stay there. 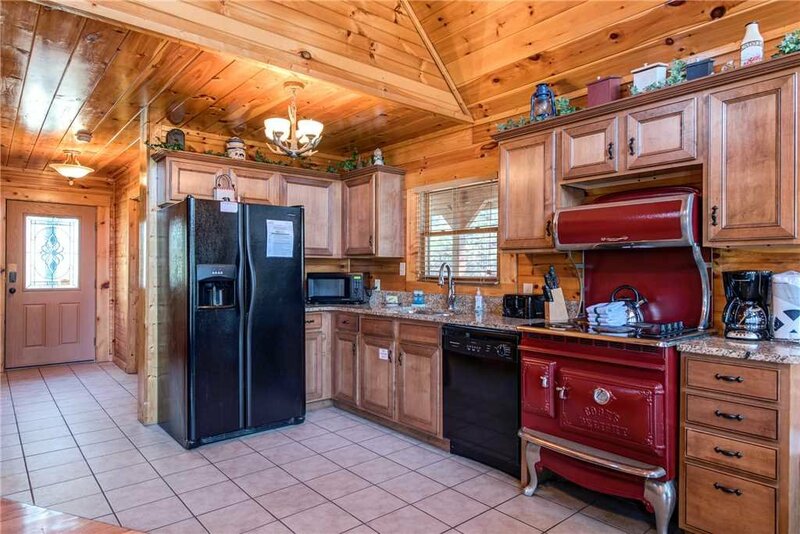 Difficult to cook with ant problem and kitchen is missing basic items like can opener' etc. 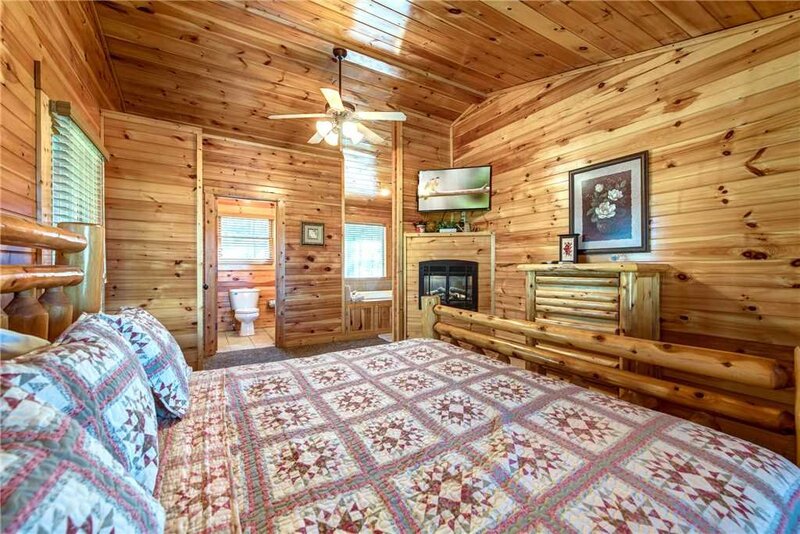 The cabin is clean and has plenty of space. Although there are a few issues. There are 36 steps from the driveway to the door on the main floor, some of the lighting on the steps needs to be repaired. The house was clean roomy and comfortable. 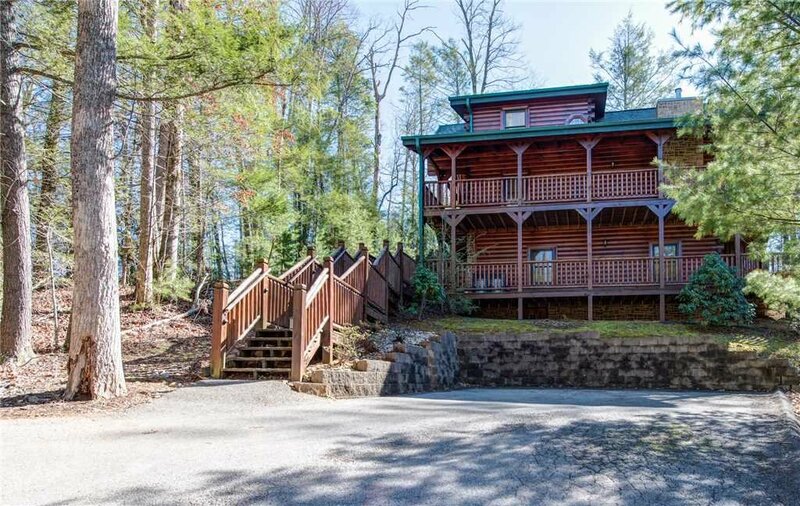 10 minute drive from downtown Gatlinburg. They stay was great but more trash cans need downstairs.